Just off the corner of Steinway is 38-13 Northern Blvd. 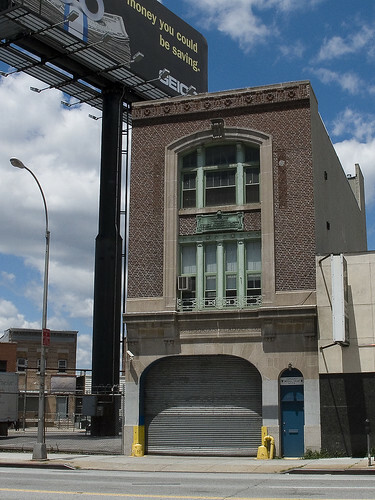 It stands opposite the cyclopean Standard Motor Products building, and at the foot of the bridge which carries Steinway into 39th street and south to Skillman Avenue over the Sunnyside Yards. Currently, the structure houses part of the NYPD’s ESU units- the Emergency Medical Squad. The building was originally a firehouse- the Hook and Ladder 66. The earliest volunteer fire company in Newtown was organized in 1843- the Wadownock Fire, Hook & Ladder No. 1. By 1902, there were 66 distinct volunteer fire departments in Queens. 19th century Long Island City was served by (amongst others) the Astoria Engine Co., the Hunter Engine Co., the Mohawk Hose Co., and the Tiger Hose Co. In 1890, the legislature of New York State abolished the volunteer departments, seeking to create a paid and professional force of firefighters. In Long Island City, as many as nine units were created, and then reorganized in 1894, as rampant political corruption had rendered the new units impotent against all but the smallest blazes. This corruption was centered around Long Island City’s mayor- Patrick “Battleax” Gleason- or was at least blamed on him by his enemies in the press. The critical date for this story is 1898, when Long Island City joined in the municipality of the City of Greater New York, and its firefighters joined the FDNY. In 1900, FDNY Commissioner JJ Scannell proposed a sweeping expansion of fire service citywide, but especially in underserved Long Island City. The “Board of Estimate and Apportionment” was asked to make funds available for infrastructure- specifically fire houses. 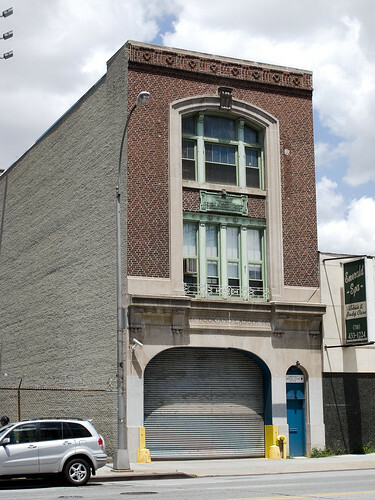 Built concurrently with the landmarked Engine 158 fire house at 10-40 47th Avenue, the building was budgeted to cost $18,000 to build and complete in 1901, but ended up costing $23,000 when it was dedicated in 1905. The architecture firm which built it was Paris & Schroeder, who designed the Bowery YMCA and many other Tammany projects. Along with the Engine 158 structure, this building was designed and overseen by Ernest Flagg and Bradford Lee GIlbert. Check this link out, for some local FDNY color from 1899. Architect of the United States Naval Academy, the Corcoran Gallery of Art, the Scribner Building, and model tenement houses, Ernest Flagg (1857-1947) advanced the cause of classicism while demonstrating a deep concern for architecture’s social responsibility. This study of one of the most innovative practitioners of the Beaux-Arts movement in America covers Flagg’s early training and Beaux-Arts works, his town and country houses, his commercial and utilitarian buildings, the Singer Tower (which established a new height record while setting a precedent for New York City skyscraper restrictions in scale and density), urban housing reform, and his small houses of modular design. Flagg, the author notes, combined French nineteenth century aesthetics and the principles of academic classicism with American structural technology to create significant buildings during the Progressive Era from 1890 to 1917. His contributions to zoning and height regulations were essential to New York’s first laws governing this aspect of the city’s architecture. A confirmed individualist, Flagg produced highly original writings and ingenious inventions for construction techniques in low-cost housing and railroad cars. Flagg’s adaptation of classicism and his concern for urban contextualism make this study of his work particularly timely. His designs have immediate relevance for contemporary architects and preservationists, as well as those interested in the social and architectural history of New York City. Bradford Lee Gilbert was born in Watertown, New York to parents Marie Antoinette (Bacon) and Horatio Gates Gilbert. Mr. Gilbert was well educated having attended Sedgwick Institute, Gt. Barrington, Siglar’s School, Newburg, Irvington and Yale College. He was a member of the New York Chapter of American Institute of Architects, The National Sculpture Society, The Architectural League, The National Arts Club, The Transportation Club, The Quill Club, The Riding Club, and The Chicago Club. Mr. Gilbert enjoyed many distinctions, but was a driving force in the growing railroad industry. He was the consulting architect to eighteen of the principal railroads in America, and was appointed as official architect to the New York, Lake Erie and Western Railroad under Octave Chanute (who assisted in the Wright Brother’s creation of airplanes). Mr. Gilbert played a major role in other railroad companies like, the enlargement to the first Grand Central Station in New York; the Illinois Central Station in Chicago, Illinois; the Boston & Maine Union Station in Lowell, Maine and many others. Bradford passed away in Accord, Ulster County, New York of Dropsy. In January of 1913, all Brooklyn and Queens fire companies had their unit numbers moved forward by 100- thus Engine 158 became 258. Hook and ladder 166’s history gets a little hazy in the intervening years, and a unit with the 166 designation seems to still be extant in Brooklyn- but the history of the FDNY is best discussed by experts. 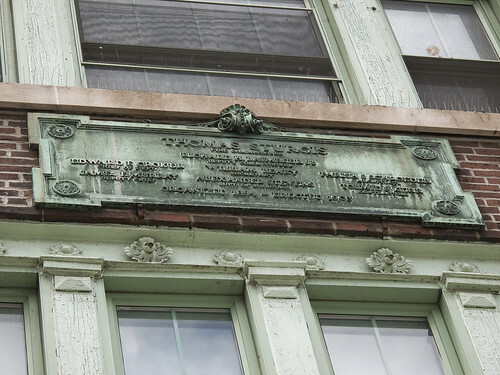 At some intervening point in the last hundred years that I have not been able to pin down (most likely the early 80’s), the building passed into the hands of the Police department which assigned its ESU NYPD Emergency Medical Squad to the premise. They are the current stakeholders, in this part of the Newtown Pentacle. ESU are the Green Berets of the NYPD, assigned the most challenging and dangerous jobs. Most are former United States Special Forces or U.S. Marines who bring ingenious skills and hard won experience to work every day. If you are in real trouble in New York City, the ESU is your personal Batman. Two fully loaded paramedic ambulances and a variety of specialized response vehicles are based here. ESU medical is commanded by a 35 year NYPD veteran and former Marine, Chief of Special Operations Charles D. Kammerdener. I have a photo of the Fire Crew from Ladder 66 or what was known after 1913 as Ladder 116. The Captain of Ladder 116 from 1906 till 1925 was Thomas F. McKeon. Any chance you’d want to share a copy of that photo for a website on the history of the FDNY? I’d love to have it. I’m trying to memorialze all the men who served and especially all the men we’ve lost over the years. I can be reached at tommcl54@yahoo.com (that’s an L before the 54). Thanks much. IM LOOKING FOR A FIREFIGHTER HORAK IN SUNNYSIDE QUEENS AROUND 1890 ANNY HELP?